Greetings again from the darkness. A film about a guy with an aversion to wearing pants would not typically hold much appeal for me, but this is no typical documentary and Mayer Vishner is no typical subject. Co-directors Justin Schein and David Mehlman raise a couple of philosophical questions here: should a person have the right to take their own life, and what responsibility does a documentarian have towards their subject when faced with an ethical dilemma? Very few younger than 50 (maybe even 60) will recognize the name Mayer Vishner. He worked closely with those who founded the radical 1960’s group called the Yippies (Youth International Party) – Abbie Hoffman, Paul Krassner, Jerry Rubin (also an early Apple investor and stockbroker), and musician Phil Ochs. A self-described Forrest Gump, Mayer states he helped them be “giants”. The Yippies challenged authority and the system at every turn and were quite proud to create the label counter-culture. Five decades later, Mayer remains holed up in his same Greenwich Village apartment not far from MacDougal St and the Gaslight Café, where much of the Yippies action took place. The small apartment is in total disarray and Mayer now lives in squalor, getting through most days with absurd amounts of alcohol and pot, and apparently very little human interaction outside of director Schein’s visits. It’s here where things get fuzzy. Schein set out to make a film about a man who was right in the middle of one of the most tumultuous times in US history, but seemed to make the ultimate documentarian mistake of becoming too close … even friends … with his subject. It’s this line-crossing that puts Schein in the cross-hairs of a moral dilemma when Mayer states, “If this film happens, it will be about a film about suicide”. Should he keep filming? Should he get help for Mayer? Should he walk away from the project and let nature take its course? What follows is an up close and personal look at a man who is still very articulate, though suffering bouts of depression due to a life of loneliness and solitude. He sees no reason why he shouldn’t be able to end his life on his own terms and in front of a camera. We also see Mayer’s periodic surges of energy … whether it’s the Occupy Wall Street movement (I’ve “been here before”), seeing his brothers, or a visit with Diane, his friend of 35 years who helps with therapeutic gardening. Of course, these surges are short-lived and each followed by a hard crash. Along the way, we see a video clip of 16 year old Mayer just beginning his lifelong journey of questioning authority. We also see the 3 pallets of memories being stored in a warehouse prior to being purchased by the University of Michigan, and we learn that Mayer was once the editor of “LA Weekly”, though fired for his alcoholism. Mayer’s own notes describe himself as an anarchist, pacifist, gardener, poet and dozens more. He clearly had a purpose in life and ultimately, in death. The film is tough to watch at times both because of Mayer’s self-destructive mode, and for the interesting and debatable issues raised by continuing with filming. Perhaps the film will have you questioning your own beliefs, though the hope is you never find yourself in this situation with a friend. 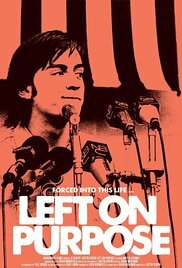 A well made documentary should educate and inspire discussion, and there’s no shortage of either with this one. This entry was posted on Thursday, February 16th, 2017 at 8:51 pm and is filed under Documentary. You can follow any responses to this entry through the RSS 2.0 feed. You can leave a response, or trackback from your own site.